Remotely operated vehicles (ROVs), are underwater robots that are tethered to a ship and piloted by a crew onboard the vessel. The tether delivers power to the vehicle and data and video images from the vehicle back to the ship, typically using fiber optics to transfer HDTV signals and high-bandwidth data from instruments such as multibeam sonars. ROVs operate in environments that are considered too deep and sometimes dangerous for divers. They are commonly used in deep-water industries, such as the offshore energy industry (oil and gas exploration), but can also be used for underwater construction, military, exploratory, science, and/or salvage missions. Some ROVs have been used to discover historic shipwrecks, including the RMS Titanic, and have been used to recover material from the sea floor and bring it to the surface. In recent years, ROV’s have become involved with offshore wind and tidal power projects. Most ROV’s are equipped with at least a video camera and lights. Additional equipment is commonly added to expand the vehicle’s capabilities. These may include sonars, magnetometers, digital still cameras, a manipulator arm, scientific samplers, and instruments that measure water clarity, water temperature, water density, sound velocity, light penetration, and temperature. ROV pilots/technicians are responsible for the operation and maintenance of this equipment, in addition to “driving” the ROV. ROV pilots/technicians possess varied mechanical, electrical, and/or computer science backgrounds and often supplement their past experience with training that is specific to the ROV systems they operate. Their work can take place aboard a commercial vessel or platform, a research vessel, a marine laboratory or onshore support facility, or in any number of other marine and coastal settings. ROV pilots are part of the shipboard crew, but there is often a team of pilots/engineers that work with the same equipment. 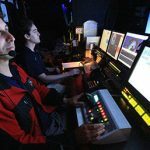 Thus, a ROV pilot/technician must be able to effectively communicate technical information and confer with other scientists and engineers so that the mission can run smoothly. Flexibility and/or ability/willingness to travel- working as an ROV pilot requires a lot of traveling as the job is mostly offshore. One must be prepared to travel to any part of the world at short notice. Underwater sound can be used to navigate and track remotely operated vehicles (ROVs). A basic underwater navigation system uses a hydrophone and an acoustic tracking beacon. The hydrophone is attached to a boat, below the water, and works like an antenna. The beacon, somewhere below the boat, transmits a signal that is picked up by the hydrophone. The system calculates the range (distance) and bearing(horizontal direction) to the beacon. The position of the beacon is determined relative to the boat. If the exact location of the boat is known, then the exact location of the beacon can be calculated. A more precise underwater navigation system uses several beacons. A ship or ROV has an acoustic transducer that combines a transmitter and a receiver. Beacons that make a pinging sound are spread out on the ocean floor in known locations. These special beacons are called transponders. The transducer sends out signals to the underwater transponders. Each transponder responds with a unique sound of its own. These replies are picked up by the transducer. Computers then calculate the exact position of the ship or ROV by determining the distance from the beacons and using simple geometry and basic math. Once you get 3 distances from 3 known points, you can calculate the position using a method called triangulation. Computers calculate the unique point where all three distances measured from the transponders intersect. ROVs carry an array of cameras and sensors, including acoustic sensors such as hydrophones. Prior to deploying ROVs, researchers will often use multibeam sonar to find “targets” on the seafloor to explore further. Multibeam systems transmit a swath of sound to cover a distance on either side of a ship that is equal to about two times the water depth. All of the signals that are sent out reach the seafloor and return at slightly different times. These signals are received and converted to water depths by computers, and then automatically plotted as high-resolution bathymetry maps. Objects as small as one meter long can be located with this technology. Brennan Phillips earned his B.S. in Ocean Engineering at the University of Rhode Island, where he also served as a student engineering assistant for Dr. Robert Ballard’s ROV program. Through this program he became trained as an ROV pilot and eventually served as Dr. Ballard’s ROV Operations Manager for several years aboard the E/V Nautilus. Brennan has logged thousands of hours piloting, supporting archaeological, biological, and geological research. In addition to ROV’s, Brennan has also worked with autonomous underwater vehicles (AUV’s) and manned submersibles, participating in dozens of research expeditions around the world. As an engineer for the Woods Hole Oceanographic Institution, he helped search for Amelia Earhart’s plane in 2009 during one of the largest deep-water sidescan surveys ever conducted. 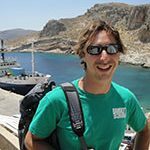 He is currently working towards his Ph.D in Oceanography at the University of Rhode Island Graduate School of Oceanography. Navigation> How is sound used to navigate underwater?